The companies debuted in Singapore early last year. As they run on a dockless system, the bicycles can be rented from and returned to any location using a mobile app. The six operators are oBike, ofo, Mobike, GBikes, SG Bike and ShareBikeSG. Since the middle of last year, LTA has issued more than 2,100 removal notices and collected about $180,000 in fines and administrative fees from the companies. 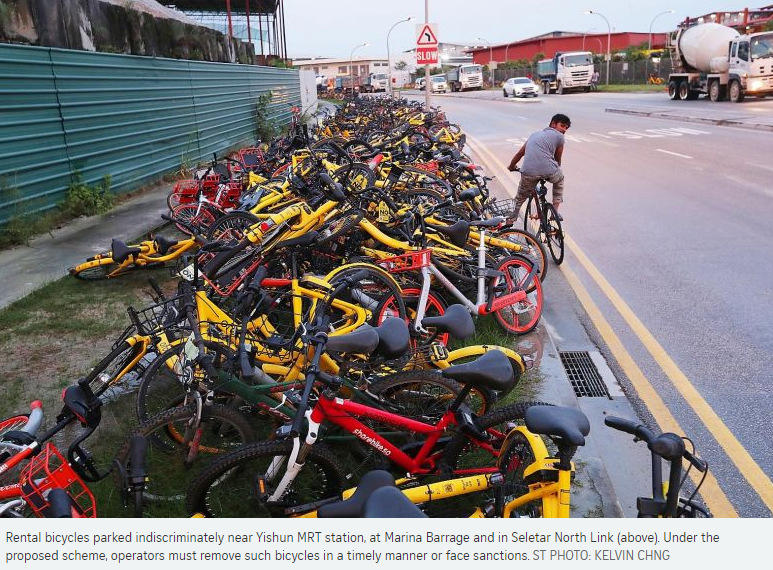 As the number of these bicycles swells, the authorities have been creating more parking spaces at MRT stations, bus stops, Housing Board estates and parks. There are 174,000 bike parking spaces, and the LTA and public agencies plan to provide 50,000 more by 2020. LTA will also install unique quick response (QR) codes at all public bicycle parking areas from the second half of this year. Operators will have to ensure that their users scan the QR code at the parking area before they can end their trip. Operators interviewed said they will work with the LTA on the licensing requirements. Most declined to disclose the extent of indiscriminate parking. SG Bike, however, said it makes up about 10 per cent of all its rides. General manager Tim Phang of oBike Singapore said that while official guidelines are welcomed, a licensing regime "places a heavy burden on start-ups and this, in turn, means users will suffer". Bicycle-sharing operators will have to apply for a licence under new rules passed yesterday to curb the problem of indiscriminate parking. Under the new laws, bike-sharing operators will have to be licensed by the Land Transport Authority (LTA), which will regulate their fleet sizes. The convenience provided by dockless shared bicycles has been "marred" by indiscriminate parking, said Senior Minister of State for Transport Lam Pin Min. "The bicycle-sharing operators have exacerbated this problem as they grew their fleets too quickly in a bid to capture market share," he told the House during the second reading of the Parking Places (Amendment) Bill. In just over a year, the number of dockless shared bikes supplied by the six rental operators here has grown to more than 100,000. Dr Lam said the LTA will take "a more conservative approach" initially and cap the number of bicycles each operator can have, based on how well the operators manage indiscriminate parking and how well their bikes are utilised. The LTA will also set industry standards, including the use of geofencing technology and defining the amount of time operators have to remove illegally parked bicycles. Geofencing technology creates a virtual boundary that sends out an alert when a bike enters or leaves an area. The operators will have to pay LTA a licence fee. The amount will be announced later. Penalties include a reduction in fleet size, fines of up to $100,000 for each instance of non-compliance as well as the cancellation or suspension of licences. "There are also inconsiderate and irresponsible users who leave bicycles outside of the designated parking areas," Dr Lam said, noting that cyclists who offend repeatedly will face a temporary rental ban. Users who are caught parking their shared bicycles illegally three times in a calendar year will be barred temporarily from renting such bicycles from any operator, he said. They will also not be allowed to end their rental sessions if they fail to return the bikes to a designated parking zone - meaning they will continue to be charged until they do the right thing. Dr Lam said operators will also have to share information on recalcitrant users and the location of the bicycles, so the LTA can track indiscriminate parking more effectively. Seven MPs and one Nominated MP spoke in support of the amendments to the law, airing the frustrations of residents who have had to deal with the consequences of badly parked bicycles. 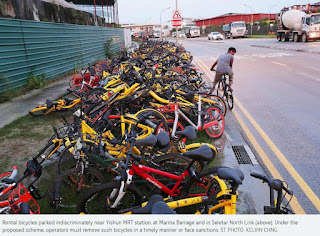 MP Joan Pereira (Tanjong Pagar GRC) said: "The arrival of dockless bike-sharing services is both a blessing and a bane to many cities, from the US to UK, Australia to China. Singapore is not spared." With the passing of the new laws, the LTA is expected to start accepting licence applications from the bike-sharing operators by the middle of this year. The licences will be awarded by the end of the year. The new regulations also apply to sharing services for personal mobility devices and power-assisted bicycles. Sharing services operating only on private land, or which use docking systems or fixed rental and return locations, are exempted. Amendments to the Parking Places Act were also passed yesterday to allow the LTA to more finely calibrate the car-parking provisions in private developments, such as by specifying the maximum and minimum numbers of parking spaces required. Currently, only a minimum number is specified, based on a development's gross floor area. Dr Lam said: "This will in turn allow us to maximise the use of the limited land in Singapore, and free up space to improve our living environment." While it is not possible to have bicycle parking spaces on every doorstep, the Government will strive to locate them within a short walk of most households and key facilities. There are now more than 170,000 bicycle parking spaces across the island, and plans are afoot to add another 50,000 by 2020. Senior Minister of State for Transport Lam Pin Min said this in Parliament yesterday, as new laws were passed to regulate dockless bicycle-sharing operators and users of the bicycles. During the second reading of the Parking Places (Amendment) Bill, MPs such as Mr Gan Thiam Poh (Ang Mo Kio GRC), Dr Teo Ho Pin (Bukit Panjang) and Ms Joan Pereira (Tanjong Pagar GRC) had bemoaned the unsightly mess caused by bicycles being left around haphazardly, calling for more bicycle parking spaces. The new law requires bike-sharing operators to share their data with the Land Transport Authority (LTA), and this will help in identifying areas of high demand where more parking spaces are needed, said Dr Lam. More than 99 per cent of public homes and 90 per cent of private homes are already within a five-minute walk of bicycle parking areas, he added. There are also such parking areas near more than 80 per cent of what are considered key destinations, such as polyclinics, community centres, schools and town centres. As for parking spaces in private developments, the LTA will work with the bike-sharing operators and have them reach out to condominium managements, foreign worker dormitory operators and commercial buildings. "However, the decision... ultimately rests with the private developer," he said. Another measure to ensure people do not leave bicycles lying around is through quick response (QR) codes, which the LTA will implement at public bicycle parking areas. Users will have to scan these codes at the parking areas before they can end their trip - otherwise, they will continue to be charged for the rental session. This will be implemented on top of GPS-based geofencing that bike-sharing operators are required to put in place. But Ms Pereira raised concerns that users can take photos of the static QR code and just reuse them at different locations. Dr Lam said each parking location will have a unique QR code, and the LTA will continue to study other methods of geofencing. He added that bicycle parking spaces will continue to be made available to users who have their own bicycles. Nominated MP K. Thanaletchimi, though, cautioned that the new regulations should not deter the take-up of bicycle-sharing and impede innovation by operators. Dr Lam said the Government is considering allowing new operators to operate in a "regulatory sandbox" on a trial basis with a smaller fleet. The LTA will grant a full licence if they can meet the standards. • Users caught parking improperly at least thrice in a calendar year will be banned temporarily from renting from all bike-sharing operators. The duration of the ban will be announced later. • Users can end their bicycle rental sessions only when they scan a QR (Quick Response) code at the bicycle parking area. This QR code must match the GPS location of the parking area, which operators will demarcate with a virtual boundary - created by geofencing technology - that sends out an alert when a bike enters or leaves the area. • Operators have to apply for a licence to run dockless bike-sharing services in Singapore. • Each operator's fleet size will be capped and reviewed regularly. An operator's application to increase its fleet will be assessed based on such factors as how well it tackles indiscriminate parking and how often its bicycles are used. • Operators have to comply with standards set by the Land Transport Authority (LTA) on the use of geofencing technology and the timely removal of bicycles parked indiscriminately. • Operators have to share with the LTA data on the location of their rental bicycles. • The LTA can take regulatory action against bike-sharing operators - from reducing their fleet size to imposing fines of up to $100,000 for each instance of non-compliance, and the suspension or cancellation of their licences. Users of bicycle-sharing services who are caught parking indiscriminately three times in a year will face a ban of up to one year from using all bicycle-sharing services, the Land Transport Authority (LTA) said in a media statement yesterday. The spelling out of sanctions against recalcitrant cyclists came as the LTA also announced that bicycle-sharing operators will have two months, from May 8, to apply for a licence. This follows the tabling of the Parking Places (Amendment) Bill in March, a piece of legislation aimed at tackling the indiscriminate parking of about 100,000 shared bicycles in Singapore. The licence will let a bike-sharing company operate for up to two years. Existing operators which fail to submit an application will have to cease operations once the application window closes on July 7. Under the new scheme, bike-sharing firms will have to share data with one another on users who park indiscriminately so bans can be imposed on repeat offenders. Their users will be required to scan the unique quick response (QR) code at the parking location as proof of proper parking before ending their trip. Users who park indiscriminately will be continuously charged until they return the bicycle to a designated parking space. Mr Mohammad Farhan Hassan, 36, who uses bike-sharing services at least once a month, worries that users might not have enough designated parking spaces near their destinations and have to face harsh consequences as a result. "Sometimes I see a bike parked in an improper place, but there is really no convenient parking spot around." Another user, Mr Chua Jie Sen, 27, expressed a similar concern. "If there isn't a parking spot near my destination, it ruins the flexibility and convenience of a bicycle-sharing service." However, a Bukit Timah resident who wanted to be known only as Ms Chan, 19, was optimistic about the new rules' impact on the public. "This will reduce the inconvenience posed to pedestrians and make shared bicycles less of an eyesore," she said. There are an estimated 100,000 dockless shared bicycles in Singapore, owned by six operators, but only about half of them are actively used. In assessing operators, the LTA will consider the operator's ability to manage indiscriminate parking by its users, its fleet utilisation rate and other factors such as the demand for the service and availability of parking spaces, when it assesses licence applications. Existing operators' track records of managing indiscriminate parking will also be taken into account. The LTA said it would take a more conservative approach to fleet sizes, given the scale of the parking problem. However, firms that show they can manage the parking issue and ensure good bicycle use would be allowed to grow their fleets over time. Bike-sharing firms will be subject to licensing conditions and industry-wide standards. Failure to comply could result in fines, fleet reductions or suspension. Unlicensed operators can be fined up to $10,000 and/or face a jail term of up to six months. A fine of $500 each day that the offence continues will also be imposed. Licence applications can be made at the LTA's website. The Land Transport Authority (LTA) has received licensing fees from six firms, which will operate 40,500 shared bicycles in all - fewer than half the combined fleet size six months ago. From Thursday, Mobike will operate 25,000 bicycles, while fellow Chinese firm ofo will operate 10,000. Singapore's SG Bikes will operate 3,000. The three have each been granted a full licence, and have paid $30 to operate each bike for two years. On top of that, they have paid a security deposit of $30 per bike, but this does not have to be in cash. Anywheel, Grab and Qiqi Zhixiang have each been granted a "sandbox licence", which limits them to much smaller fleets. Anywheel and Grab will have 1,000 bikes each, and Qiqi will have 500. All three pay a licensing fee of $12 per bike, without the need for any security bond. None of the operators wanted to reveal its fleet size, but it is estimated that there were more than 100,000 shared bikes in Singapore before the licensing regime was announced early this year. The Straits Times understands that the bigger players have since been paring down their fleets. Both Mobike and ofo said yesterday that they will meet their regulated fleet sizes from Thursday. In an announcement yesterday, LTA said ofo was granted a maximum fleet size of 25,000 bicycles, which was "much lower" than what it had originally applied for. But the firm subsequently requested to operate a reduced maximum fleet size of 10,000 bicycles instead, and LTA has agreed to this request, the authority added. "Under the new licensing regime, all licensees are required to reduce their fleet size to meet their assigned maximum fleet sizes by Nov 1," LTA said, adding that it will regularly review the fleet sizes, taking into account factors such as the operators' performance and user demand. The next round of applications for operators to apply for new licences or bigger fleet sizes will open in January 2019.